For the past 36 years, Second Harvest has been the leader in alleviating hunger in our community. We are pleased to share the latest information about Second Harvest’s direct and lasting impact in our most recent annual report. 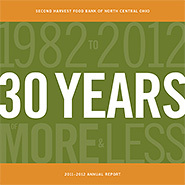 We celebrated 30 years of service to North Central Ohio in this report, published in January 2013. Click to download!